How do we get your students to treat supplies well? How do we keep our nice things actually nice, so kids have the tools they need to create their masterpieces. 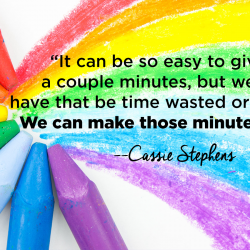 Join Cassie as she talks about why your kids need to be using “the good stuff” when it comes to supplies (3:45), why you need to hold your kids accountable (8:30), and the various reasons you may need a backup set of supplies (14:45). Full episode transcript below. Girl. I’m holding a coffee can of broken crayons here. Thankfully my principal took pity on me, gave me a little bit of a budget, and I spent that money on … I didn’t know, markers. Markers seemed like the right thing that I should have in my art room. All kids like markers, right? I was so excited that I had these beautiful packs of 24 markers, one set per table, and I made sure to tell the kids just how important it was to take care of those markers, and the routine. You can imagine my sadness when after being gone a day, leaving those markers out with my students, and the sub, how broken hearted I was to find the markers scattered all over the tables, most of them left uncapped, half of them on the floor. They were complete garbage. I was devastated, and I was so frustrated with my students. Why had they not taken care of these art supplies? It was just this and a broken can of crayons. Didn’t they understand? We’re going to talk about it. 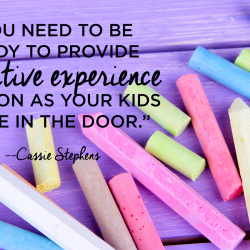 How do you get your students to take care of the art supplies in the art room, so that you don’t end up with dried up markers and a coffee can of broken crayons? I’m Cassie Stephens, and this is Everyday Art Room. Yeah. 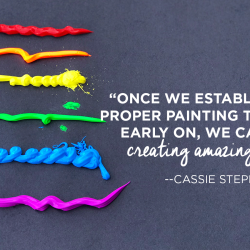 How do we get our students to treat the art supplies well so they last a long time, and so that our students can have great supplies to create their masterpieces with? It’s like the age-old question, the art teacher Rubik’s Cube. How do we do it? I’m going to share with you a handful of tips today, things that have worked for me, things that I’m still working on because let’s face it. I was never really great at Rubik’s Cube, and this is one problem I’m still trying to solve. I will share this with you, that I have discovered after my many years of teaching art, tip number one, make sure that you give your students the good stuff. My problem first year of teaching was not having a clue what the good stuff was. I think I’ve shared this with you before, but my very first year teaching art in an elementary classroom was my very first time to actually be around elementary-aged children. My student teaching had been in middle school and high school, so I had no clue, number one, what I was doing, and I still don’t, thank you very much. Number two, what art supplies were appropriate for this age group, and what art supplies were the best. Let’s be honest, despite the fact that there’s exactly 273 different kinds of markers you can buy in your art catalog, not all of them are created equally. For that, you’ll need to do a little bit of homework, and there’s plenty of posts on The Art of Ed, on my blog, and on many other art ed blogs, where we share some of our very favorite art supplies. For that, you will need to do a little bit of homework, but it’s really important that you give your students the good stuff, the stuff that’s really going to make them successful at art, because that’s what’s going to inspire them to continue to create, and to take care of art supplies. Let me give you an example. When I’m painting with my students, my very favorite paintbrushes are by Royal Lang Nickel. They’re just the best, according to me, and I’ve tried a lot. There’s nothing worse than having kids paint with brushes where the bristles are constantly falling out. Royal Langnickel for me, that’s my jam. I love them so. The other day I was in a kindergarten classroom taking photos of my students for an upcoming art project, and the teacher, who is absolutely delightful, I was thrilled to see was doing a guided drawing with her students. I love that the teachers I work with do art outside of the art room. When the kids were done drawing, she gave them paintbrushes to paint, and I almost fell out. You all, these paintbrushes she was passing out to the them were the kind that you would maybe see at the Dollar Store, where they sell exactly 20 million a pack for a dollar, where the bristles are super wiry. The poor kids were trying their best to make do with these paintbrushes that look like they’ve literally been pulled out of a garbage disposal. I said to my friend, “Please let me bring you some of my paint brushes. You’ll be amazed how much better they work.” Friends, you just got to make sure you’re giving your kids the good stuff, because like I said, when you give them the good stuff, they make good art, and then they’re more excited about what they are creating, so that’s tip number one. Tip number two is this. I really like to graduate my students up to certain art supplies. For example, recently I started a drawing project with my fourth grade students, and I had been waiting a while to graduate them up from the white eraser to the kneaded eraser. We had a big long talk about how special these erasers are, how my first time to use them was my freshman year in college, how great they are at erasing small areas, how to clean them if they get dirty. You all, they were so excited to graduate up to these special erasers. If you have supplies like that in your room, certain things that you know your students won’t be using until they’re a little bit older, make sure you make a big deal about it. Let those kids know, hey, you guys are now mature enough artists that I’m actually giving you something that I didn’t get to experience until I was 18 years old. My students were thrilled to work with these, so definitely consider having some art supplies be special, that the kids graduate up to them, and also let them know how special it is that they’re working with these supplies, because I have noticed that they do make sure to take care of them a lot better when they do. However, and you knew this was going to take a turn, when I said kneaded eraser, I know where your mind went. Stephens, what if they steal those? This leads me to my next point. Hold them accountable. I love my fourth grade kiddos. They are a fabulous group of kids, so you can imagine my sadness when, after not having a system for counting up my kneaded erasers, thinking I didn’t need to, I was so bummed when a fourth grade student came to me and told me that they saw that one of my kneaded erasers had made it outside of the art room from the pocket of a student. I was devastated, and I let the kids know how devastated and disappointed I was. Not that it got me back my eraser. There was a lot of denial involved, but I realized that the fault really fell on me, because I did not hold them accountable. My new system for my kneaded erasers is to have a special container per table that will have four kneaded erasers, one for each student. At the end of art class, we will, unfortunately, have to count those erasers. It’s stuff like that that I don’t like doing, but you kind of have to. Holding kids accountable for things that are very tempting, like a kneaded erasers, like an Exacto knife, not that I would use that with my kids. You know those things that are high temptation, bottles of glue, slime much, you all, make the kids know that you’re going to hold them accountable for these art supplies, and they are definitely going to take care of them a lot better, and make sure that you get them back. Another thing of this, speaking of erasers, what’s with the temptation to stab or bust in half erasers? Why, you all? 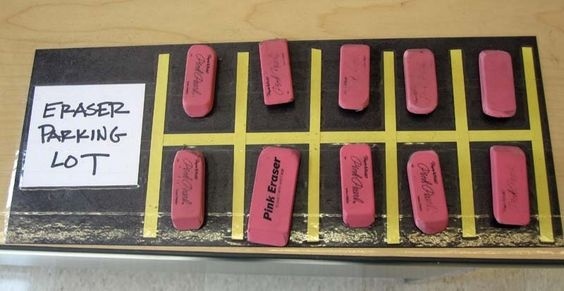 What did that poor eraser every do to you except to get rid of your mistake? That’s another way to hold the kids accountable. If they know at the end of art class you’re going to be doing even a quick glance at the art supplies, or have a student do it like art teachers in training, as we’ve talked about in past podcasts, if they know that they’re going to be held accountable for such things, then they will, fingers crossed, knock on wood, hopefully take care of them a little bit better. There’s always our friends who keep pushing the envelope, and for me, this usually happens when I’m introducing painting to my younger students. This brings me to my next point, which is to make sure to have a backup set of art supplies for your friends who quote “aren’t ready yet.” Let me give you an example. When my kindergarten students first start watercolor painting, and we chatted a lot about watercolor painting in last week’s podcast, so if you missed it, make sure you go and take a listen, because I could really go into all of the little things that I say and do with the students so that they really are able to achieve beautiful paintings without having a paint pallet or a paint tray that’s all mixed up. We all have those students who don’t understand that in between getting a new color of paint, it’s important that you clean your brush, so for that reason, I always have a backup set of art supplies for my friends who just aren’t ready yet, emphasis on the yet. For example, this year when I had my friends in kindergarten town painting, I had one friend who even after I reminded him, “Hey, buddy. Remember, wash your brush, dry your brush, get a new color.” I stood next to him. I demonstrated it. He showed me he knew how to do it, and I walked away, and came back a short bit later. His paint tray was completely demolished again, and I said, “Oh, I’m so sorry, but it looks like you’re not yet ready for paint.” I took away the paint, and then he was left with coloring his picture with crayons. I know it sounds mean, but the next art class, he did not mix up his paint at all and made sure that I was well aware that he did not mix up his paint, and he has not since. In fact, he’s become a very meticulous little artist since then. 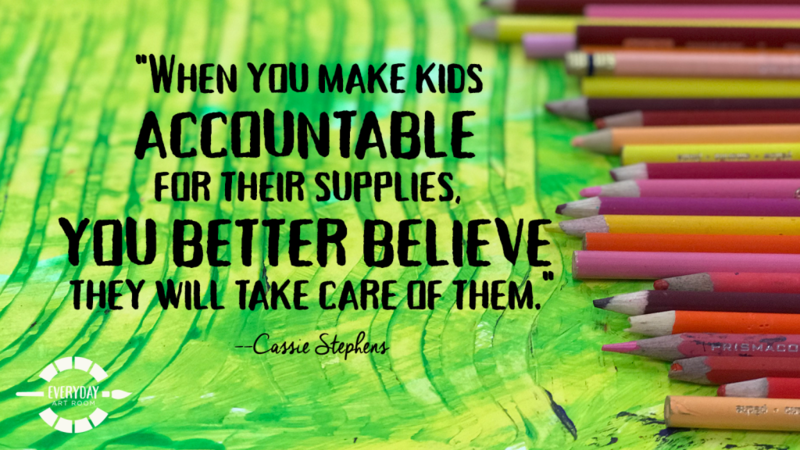 Once students know that you’re serious about the treatment of your art supplies, you’ve shown them, and you’re holding them accountable, and if they don’t follow those rules, then maybe they’re not quite ready yet. Then they’ll take far better care of them, so that’s just another idea to make sure to have a backup set for friends who just aren’t ready yet. Also, I think it’s really important to hold our students to a high standard. We all know based on all those millions of hours we spend in our art ed classes, at the different levels at which each grade level or each age level our students should be at, meaning we know that when they’re in kindergarten, they’re going to do the whole stick man figure thing, and we know that when they’re in first grade, they do it a little bit more elaborate, et cetera, et cetera. However, I don’t like using those as an excuse for allowing certain kind of artwork to happen in my art room. I have a pretty high standard. I’m not mean and rotten about it. I just tell my students that I know what amazing artists they are, and I expect them to do their best and create the most amazing artwork I’ve seen. For that, they’ll definitely have to make sure to be taking care of their art supplies. Yet another way to reinforce how important it is to take care of art supplies in the art room. Side note, it’s also important to make sure, getting back to my little intro story at the beginning, super important to make sure that you have a subset of whatever it is your students might be using when you are not there. That was my very biggest mistake, not having a set of supplies that I didn’t care too much if they got damaged, because I wasn’t in the room to remind the kids what to do. Usually when I’m gone, if I don’t know who my substitute teacher is going to be, I will usually leave my students with crayons or construction paper crayons. I would never leave them with markers anymore, or watercolor paint, or heaven forbid something like cray. Oh, my goodness. That would be a disaster. Definitely make sure that you have a set of art supplies that are separate for when you’re absent, that you won’t mind too much if they get damaged. There you have it. Oh, and one last thing. I almost forgot, and this is probably the most important tip of them all. Please make sure that you assume they don’t know a single thing about any of the art supplies in your room. Meaning if you are going to introduce kids to markers, or painting, or anything like that, don’t assume that they know how to know when the cap is completely on the marker. Don’t assume that they know that they need to wash their paintbrush before getting a new color. Explain everything. It may feel really ridiculous, but I really wish that I had done that during my first year of teaching. It would have saved me so much frustration, and my students as well. Okay. That was a lot, but I think I’ve got it covered. How to get students to really value and take care of the art supplies in your art room. Tim Bogatz: After you’ve finished this episode of Everyday Art Room, I want you to head over to theartofed.com. We have a big announcement coming up today with the featured presenter for our Art Ed Now conference on February 3rd. I don’t want to give anything away, but I think you will be very excited when you see who it is. If you haven’t attended an Art Ed Now conference before, February is the perfect time to do it. We’ll have over 20 presentations that are all online, all incredible, and all relevant to what you’re doing right now in your classroom. Along with our featured presenter announcement, we are sharing five more new presentations, to give you an idea of what will be available at the conference. 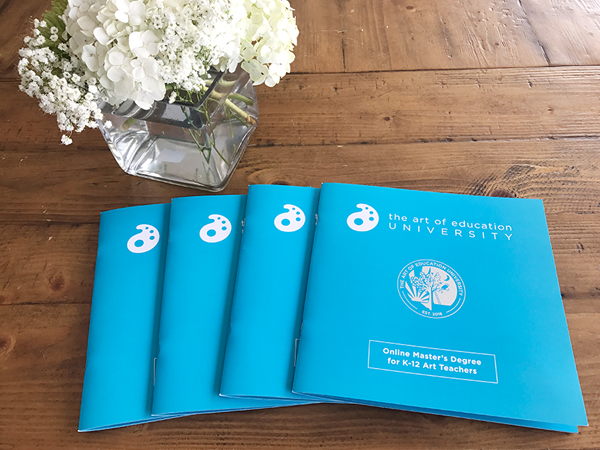 Each presentation comes with resources and handouts for your classroom, and you have access to every presentation for a full year after the conference. You can learn everything you need to know about the conference at artednow.com. Make sure you go check that out as soon as this episode is over. The beauty is, you can actually take the stitches out and start over, so it’s actually better than collage. With that in mind, whenever I got a little bit tensed up about using my sewing machine, I just took a deep breath and was like, it’s just like collage. I can do this. The beauty of sewing machines these days is they’re so easy. The manual, and I’m not a reader of manuals, but the manuals are fabulous. They’ll walk you through everything you need. It’s seriously super simple. You can get a great sewing machine at a very inexpensive price, at your local big box store. If you’re going to do a lot of sewing, you might want to do more homework to find a machine that’s going to last a little longer. Personally, if I were just giving advice to somebody just starting out on sewing, I would say, “Spend no more than $150 on a sewing machine.” Personally I use a Brother, and I love it, but I have a couple other brands that I also like as well. That’s sewing machines. When it comes to patterns, patterns, they are not difficult to follow, but I will tell you that not all patterns are created equally. I personally prefer patterns by Simplicity, because the name says it all. The great part is is that there’s even like, on a lot of these patterns these days, there’s a 1-800 number where you can call and you an ask, or you can just hop on YouTube, type in the pattern number, and usually somebody is giving you a tutorial on how to make that very outfit, or skirt, or whatever it is that you’re creating. Tie, if you’re Tim. I’m sure he’s sewn a dozen, so yeah. Just take a deep breath and enjoy it. It’s a learning process. As far as fabric goes, well, I actually do my recording of podcasts in my sewing room so that I’m surrounded by fabric, and so that the sound is a little bit better. Buying fabric, based on the amount of fabric that I have in this room right now, is my most favorite part. There are so many fun, artsy fabrics to choose from. However, if you’re just getting started, was I bought bed sheets at the local thrift store because, especially vintage ones have really fun patterns on them. If the idea of that makes your skin crawl, I totally understand. Just get yourself to a local fabric store, or look around online. If you even Google something fun like primary color fabric, or art supply fabric, Monet fabric, you will be surprised how much you will find. It’ll probably get you in a whole lot of trouble, so it’s good that I’m telling you all this a little bit before Christmas. You can start putting these things on your Christmas list, and just know that this is just clothing that you can wear to teach in. It doesn’t have to be perfect, and nobody needs to get so close to you that they’re going to see that your hem is crooked, or that you’ve got a wonky zipper. Trust me, my zippers are all wonky. It’s part of the reason I have long hair, to hide the zipper. Anyway, all that to say I love creating clothing to wear. My students love seeing it as well, and a lot of times it inspires them to want to do the same, so great question, and hopefully that answers some thoughts that you all might have about venturing into the what the art teacher wore craziness adventure, because it is really so much fun. If you guys have questions for me, please free to send them my way. You can send them to [email protected] You want to hear something funny? I actually still have a coffee can of broken crayons in my art room, and I know this because I was in my art room today digging in the back of a cupboard, and I was like, “It’s still there.” Of course I’m not at the same school. I just think that this coffee can of crayons is haunting me, and of course I can’t get rid of it. It’s an amazing can of broken crayons, and it just reminds me what I can do to get my students to take care of their art supplies. Thing number one, which I failed to mention at the very beginning of my chat, is teaching them everything. Assume they know nothing, especially our friends these days who spend a whole lot of time on Mama’s phone, and not as much time using markers and crayons. Assume that they don’t know how to use these art supplies, and that will really make it so that you cover all of the details of how you want them to take care of art supplies. Make sure that you give them the good stuff. Nobody wants to use those crayons that don’t color very well. You all know the brand I’m talking about. I’m not going to say it, or the markers that are dried out, or the watercolor paints that are just not vibrant. Kids know when they’re using stuff that’s not working, and it’s no fun. We don’t want to create with art supplies like that, so neither should our students. Make sure that you graduate them up to the quote, “real art supplies,” or the serious art supplies, like fun things, like kneaded erasers, or certain clay tools, or specific printmaking supplies. Also, as I learned the hard way, be sure and hold them accountable, especially for those supplies that might be a little too tempting to take out of the art room. Of course have a backup set of art supplies for friends who just quite aren’t ready yet, quite aren’t ready? What was that? Who aren’t quite ready yet. It’s not that they’re not ready. It’s just that maybe they’re testing the limits, and I’m telling you, you only have to bust out that set with a particular student once before they realize how serious you are about them taking good care of your art supplies. Of course, make sure that you hold your students to a higher standard and have a backup set for the sub. Don’t let that sub bust out your very best oil pastels, or your fancy schmancy, I don’t know what you have that’s fancy schmancy that you don’t want to have messed up. Just make sure you have a special set of the kind of, I don’t care if it gets damaged art supplies that your sub can use with your kids. Woo. Getting our students to take care of art supplies, that Rubik’s Cube that we are definitely going to solve. Thanks for joining me, ya’ll. This is Everyday Art Room, and I’m Cassie Stephens.